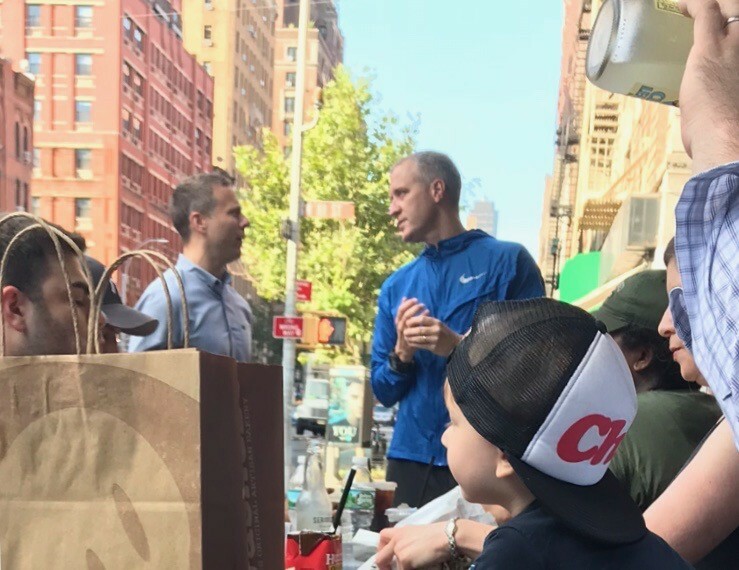 How Competitive is NY18 Without Sean Maloney? The popular Hudson Valley congressman is running for state attorney general. With polls showing him running strong, it's worth asking what happens to his congressional race. Maloney holds a "running townhall" in the Upper West Side as part of his campaign for Attorney General. The Hudson Valley is in the electoral spotlight this season. New York’s 19th Congressional District is at the epicenter of an effort by national Democrats to retake the House of Representatives, the Republican nominee for Governor is Dutchess County Executive Marc Molinaro, and two Hudson Valley residents are running for State Attorney General. One of those residents is facing tough questions from constituents and voters over what he’s giving up to run for higher office. That is Congressman Sean Patrick Maloney, who represents New York’s 18th district, which covers Orange County and areas between northern Westchester and Poughkeepsie. (Full disclosure: I worked for Maloney several years ago.) Then there’s Zephyr Teachout, a Fordham law professor turned politician who challenged Andrew Cuomo in the 2014 Democratic gubernatorial primary before moving to the Hudson Valley to run for Congress in 2016. She lost both races. Also running are New York City Public Advocate Letitia James and Verizon Vice President and former Hillary Clinton staffer Leecia Eve. They are all vying to replace disgraced former Attorney General Eric Schneiderman, who stepped down in haste after the New Yorker reported that he had sexually abused several women. Acting Attorney General Barbara Underwood eschewed calls to run for a full term. The primary is crucial; given the ideological makeup of New York, whoever wins the Democratic primary is expected to coast to the office. Early polls showed James leading, thanks to massive institutional support from Governor Cuomo, the state Democratic party, and many other prominent New York politicians, unions, and political clubs. Maloney, who lacks any institutional support in New York State politics but wields a $3 million war chest from his congressional campaigns–which, through much controversy, he was able to channel towards his attorney general run–was in second. He narrowly led Teachout who is backed by fellow progressives Cynthia Nixon and Andrea Ocasio-Cortez, the New York Times and grassroots organizations like Indivisible. Leecia Eve was trailing by a large margin. As a white male with a moderate voting record in Congress, Maloney was considered an unlikely choice to replace Schneiderman in the midst of the #MeToo movement and a surge of progressive energy. (Though, it should be noted, he would be the first openly gay male state attorney general in US History). However, he is now leading the pack narrowly in the latest Siena poll. This could perhaps be chalked up to the fact that James, Teachout, and Eve are all drawing from roughly similar pools of voters–young, diverse and progressive–whereas Maloney has a very different appeal that attracts a more well-to-do, suburban base. Another factor has been Maloney’s ability to blanket the airwaves, thanks to his massive campaign coffers. With over 40% of voters undecided in the early polls, that has probably made a huge difference. With 30% still undecided in the latest poll, it may just tip the election in Maloney’s favor. But one big question swirling around Maloney’s attorney general candidacy is “what happens to his congressional seat if he wins?” Many voters have expressed uneasiness about the idea of nominating Maloney for fear that the district–which voted for Donald Trump in 2016–would fall into Republican hands. The issue has not been isolated in the Hudson Valley either; voters at one of Maloney’s town halls in the Upper West Side expressed an equal concern about the vulnerability of his seat and the balance of power in Congress. Maloney has said he "has a plan" for the seat, but has declined to elaborate further. It’s fair to say that this issue will be a crucial one for primary voters, and is therefore worth taking a look at. Although Maloney won a third term by a formidable 11-point margin in 2016, dispatching an underfunded and obscure Republican candidate, Trump also narrowly won his district. The 18th district contains Orange County, which is a swing county, portions of Southern Dutchess and Northern Westchester, which lean Democrat, and all of Putnam County, which leans very Republican. This all evens out to make it very competitive. But despite the electoral evenness of the district, Maloney has had it locked up ever since he narrowly defeated former Rep. Nan Hayworth in their 2014 rematch, after initially defeating her reelection bid in 2012. In the former, he was outspent by Hayworth, but he has since consistently led his opponents in funding by seven figures. He was, and still is, widely expected to coast to reelection this year if he were to remain on the ticket. If Maloney wins the Democratic nomination for attorney general, and subsequently stands down from his seat, that shakes the congressional race up a lot. This is due in no small part to none of his potential replacements on the ticket looming nearly as large in the district as he does.